The Sports Legacy Institute (SLI) held its 2nd Annual Tom McHale Memorial Fundraiser, in memory of Tom McHale. 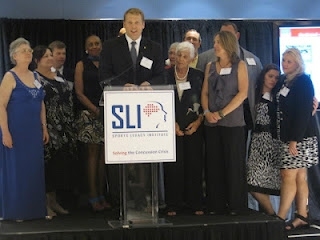 Several of us who earlier in the day hosted the 2nd Annual SPIRIT Scholarship Awards Celebration, decided the coincidental same-day timing of both SPIRIT Scholarship and SLI events was enough to signal that [Robert would want] SPIRIT should support SLI. So we hopped on the Metro for the ride from Rockville to DC. The cocktail hour event was in the lower atrium of Washington Center, at 1050 Connecticut Ave. NW in DC. The event was held to raise money for teaching educational awareness and conducting research on concussion injury and prevention. Tom McHale was a former NFL and Montgomery County Public Schools Watkins Mill High School football player, who following his tragic death of a drug overdose at age 45. Following his death, McHale was diagnosed with post concussion syndrome and chronic traumatic encephylopathy (CTE) due to repeated head trauma throughout his football career. Like so many other football players and athletes in sports with exposure to head impact (soccer, boxing, wrestling, baseball, and pole vaulting, etc.) the brain is at risk for injury. SLI has a collaborative partnership with Boston University's Center for the Study of Traumatic Encephalopathy (CSTE). Sports Legacy Institute's CEO is charismatic Chris Nowinski, author of Head Games and himself suffering from post concussion syndrome. Chris will reach out to families following the tragic death of a someone with a history of concussions or exposure to head trauma from contact sports. He will gently ask newly grieving families to donate their loved ones' brains to CSTE for research. CSTE will analyze donated brain tissue and topology for evidence of brain degeneration and CTE. An estimated 200 people listened to Chris Nowinski explain the history and current efforts of SLI and the CSTE, including a video about the many affected players, from childhood through high school, college, and a pro NFL career. Dr. Ann McKee, MD, professor of neurology and pathology at BUSM and director of VA CSTE Brain Bank, spoke about the physiology of CTE. Lisa McHale (widow of Tom) spoke about the life of Tom and her sons. We personally were able to introduce ourselves to several "Legacy Donors", people who donated their deceased family member's brain to CSTE for research. Ollie Matson, Jr., chatted with us about sports safety and his dad, Ollie Sr., who after his death in 2011 was diagnosed with CTE. We met the concerned parents of Austin Trenum, a 17-yr. old from Manassas/Brentsville, VA, who committed suicide two days after a football game concussion in 2010. And the smart and articulate Lisa, Tom's widow. Fourth & Goal, and former Baltimore Colts 1972-1981, and San Diego Chargers 1982-1983 blogged about the event. Laird quotes Lisa McHale's speech, "How could a life of such promise end so tragically?" Yes, how true, how sad. The SLI and the CSTE are working to fix this. They are working to get the attention of the media, NFL, players, and families. On the left, watch the trailer to the upcoming film documentary version of "Head Games, The Film". This film premieres on June 6, 2012 in Boston, and June 7 in Philadelphia. Game Changers - How dramatic brain discoveries are influencing America’s most popular sport. The Impact of Concussions in Youth and College Sports: Christopher Nowinski - Dr. Robert Cantu and Christopher Nowinski shared their findings on "The Impact of Concussions in Youth and College Sports" with the Williams College community.